BOTW has been on hiatus, I think in part because too many great authors have passed away in recent times, and BOTW's unplanned conversion to an authors' obituary page got depressing. What I've decided is that BOTW will go back to emphasizing authors who are living (or died sufficiently long ago that it's no longer sad) and if we wish to honor a recently departed author we will do that in a supplemental tribute. With that in mind, the Book of the Week is a recent find, the first edition of No Enemy But Time by Michael Bishop. 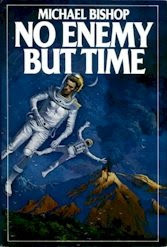 Published in 1982, No Enemy But Time won the 1983 Nebula Award for Best Novel. First editions of major award winners tend to appreciate significantly in value, so I was delighted to find this copy at a reasonable price. The cover art is by Vincent DiFate, who is one of the all-time top SF/F illustrators, although this cover unfortunately follows an embarrassing genre tradition: the cover obscures the fact that the book's protagonist is African-American. The Nebula Award is presented by the Science Fiction and Fantasy Writers of America, who also honor two authors each years as Grand Master and Author Emeritus. Beginning next week, we will pay tribute to this year's honorees.